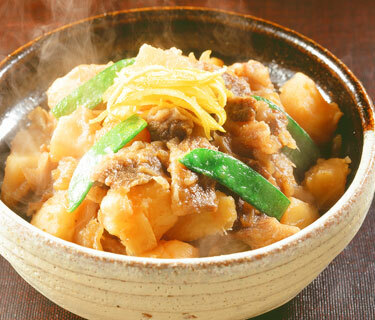 "Niku-jaga" (stewed meat and potato) is a representative home-style Japanese dish. Its origin is unique in that Admiral Heihachiro Togo, a Meiji-era naval officer, tried to reproduce the beef stew he ate when he was studying in the United Kingdom. Hiroshima Beef retains its tender texture even after stewed, and the flavor permeates thoroughly. 1) Cut beef into 2 in. wide strips. 2) Peel potatoes and cut in about eight pieces each. 3) Cut onion lengthwise into wedges. 4) Grease the pan with cooking oil, place in the onions and potatoes therein and sauté. When the surface of the vegetables is coated with oil, add the beef. 5) When the color of the surface of the beef change, add stock and cook over high heat with a drop lid. 6) When the stock has been boiled down slightly, add soft-shell peas with fibers removed. 7) Cook over medium heat until the liquid has almost entirely evaporated. Make sure that the vegetables remain their firmness and do not become mushy. 8) Serve in a dish and garnish with fine juliennes of yuzu peel. The cattle of Hiroshima Beef , with its simple but strong-tasting meat, are raised in ideal conditions featuring vast meadows and abundant pasture grass. It has fine meat fiber and contains no excessive fat. Its meat is bright red in color with fine, delicate fat marbling, which brings about a delicate taste and rich flavor particular to Hiroshima Beef.